The Riles Clubhouse Men’s Tennis Ratings have now been updated with matches completed through November 2nd, 2014 (Paris Masters 1000). The rating takes into account the same number of tournaments as the ATP rankings but instead of a point system, it tracks who you beat and who you lost to. It does weigh the results from each tournament based on the potential ATP points so a win in a ATP250 is worth 1/8th than a win against the same player in a grand slam. The rating number is percent chance player has of winning against average professional ATP tennis player. One interesting item is that the ratings still have Nadal as the #2 rated player ahead of Federer. This includes Nadal’s poor performance (although limited matches) basically post French Open. Since these ratings are based on who each player wins and loses against, it is a better comparison than the current ATP system. 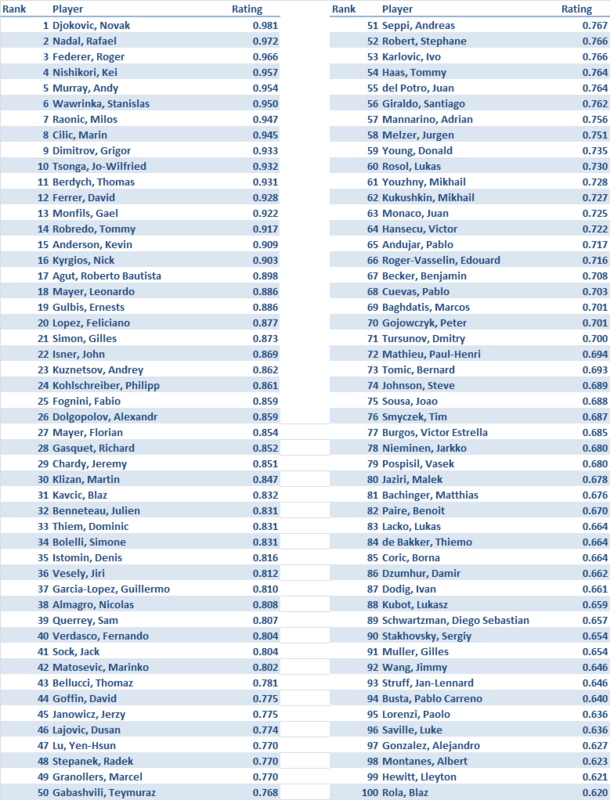 The chart below compares the Riles Clubhouse ratings to the current ATP rankings. 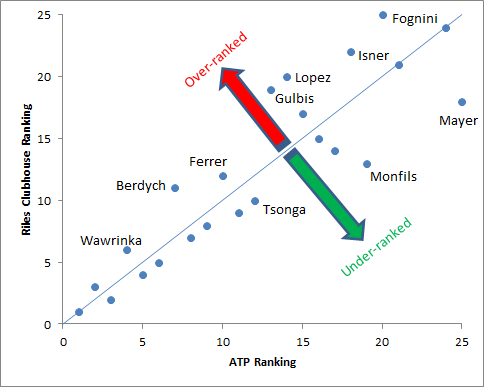 The farther above the line, the more the ATP ranking is too high and the player is over-ranked. Likewise, the farther below the line, the more a player’s ATP ranking is under-ranked. From this, the players that are most over-ranked are Wawrinka, Ferrer, & Berdych, while the most under-ranked players are Monfils and Leonardo Mayer. This sets up Djokovic very well based on the groups in London. Predictions for the ATP Finals in London will be coming soon.